The Zhangye National Geopark in Gansu, China is one of the most beautiful landforms in the country. The unique and colorful rock formations cover some 124 square miles. They are smooth, sharp, and several hundred meters tall. The rock formations are the result of sandstone deposits and other minerals accumulating over the course of 24 million years. This popular destination is beloved by both locals and foreigners. 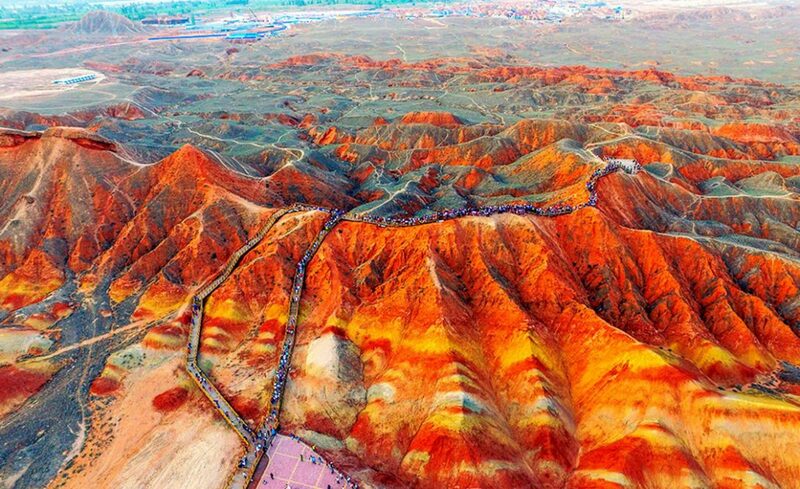 In 2005, Zhangye National Geopark was voted the most beautiful Danxia landform area in China by a panel of reporters from 34 major media outlets. Visitors can explore the formations via access roads and boardwalks, which provide added accessibility. Tall sightseeing platforms are scattered throughout the park for hikers and drivers to see the spectacular views, but visitors should take caution: the heat, dry air, and strong sunlight make for a very tiring day, so come prepared. The park itself is located in the northern foothills of the Qilian Mountains in Linze and Sunan counties. The core area of the park, the Linze Danxia Scenic Area, is around 20 miles west of downtown Zhangye. This is the most developed and visited part of the park. Summer and Autumn are the best seasons to visit this spectacular National Geopark, and visitors have the option of nearby camping or hotels in the surrounding cities.